The loss of upper and lower motor neurons in patients with amyotrophic lateral sclerosis (ALS) leads to paralysis and death. Given the difficulty in replacing motor neurons, treatment approaches have turned to neuroprotective strategies including astrocyte replacement or growth factor release. Previous research has established that transplantation of cortical‐derived human neural progenitor cells engineered to secrete glial cell line‐derived neurotrophic factor (hNPC-GDNF) into the lumbar spinal cord of ALS model rats significantly enhanced motor neuron survival [1, 2]. However, even given these improvements, hNPC-GDNF spinal cord targeting failed to alleviate paralysis. Now, researchers from the groups of Clive N. Svendsen and Gretchen M. Thomsen (Cedars‐Sinai Medical Center, Los Angeles, CA, USA) have demonstrated that targeting hNPC-GDNF to the motor cortex instead of the spinal cord significantly affects upper and lower motor neurons, delays disease onset, and extends lifespan . Overall, this new STEM CELLS study suggests that growth factor release in the motor cortex may represent a promising therapeutic strategy for the treatment of human ALS patients. Following transplantation into the motor cortex of SOD1G93A ALS model rats  via multiple injections, hNPC-GDNF migrated, matured into glial fibrillary acidic protein (GFAP)-positive astrocytes, and released GDNF as required. The authors correlated GDNF-release to the improved health of upper motor neurons and enhanced survival of lower motor neuron survival, a finding previously observed for spinal cord targeting of hNPC-GDNF. However, motor cortex targeting of hNPC-GDNF also led to a delay in paralysis and extended rat lifespan. Even more encouragingly, hNPC-GDNF cells injected into the motor cortex of cynomolgus macaques survived and expressed GDNF without any observed unwanted side effects. To advance motor cortex-targeted hNPC-GDNF therapy to treat human patients in the clinic, the authors are currently performing good manufacturing practice pre‐clinical small and large animal studies where they currently report the absence of adverse effects when targeting the motor cortex of rats. However, the team notes that maximum benefits for this type of therapy may derive from the combinatorial treatment of multiple regions (brain/spinal cord/muscle). To discover more about how targeted engineered neural progenitor cell therapy may represent an improved treatment for ALS patients, stay tuned to the Stem Cells Portal! Will dual targeting of hNPC-GDNF to the spinal cord and motor cortex synergistically improve outcomes in ALS model rats? Will motor cortex targeting of hNPC-GDNF provide therapeutic benefit in large-animal studies? What other growth factors may further improve this therapeutic option? Suzuki M, McHugh J, Tork C, et al., GDNF Secreting Human Neural Progenitor Cells Protect Dying Motor Neurons, but Not Their Projection to Muscle, in a Rat Model of Familial ALS. PLOS ONE 2007;2:e689. Klein SM, Behrstock S, McHugh J, et al., GDNF Delivery Using Human Neural Progenitor Cells in a Rat Model of ALS. Human Gene Therapy 2005;16:509-521. Thomsen GM, Avalos P, Ma AA, et al., Transplantation of Neural Progenitor Cells Expressing Glial Cell Line-Derived Neurotrophic Factor into the Motor Cortex as a Strategy to Treat Amyotrophic Lateral Sclerosis. STEM CELLS 2018;36:1122-1131. 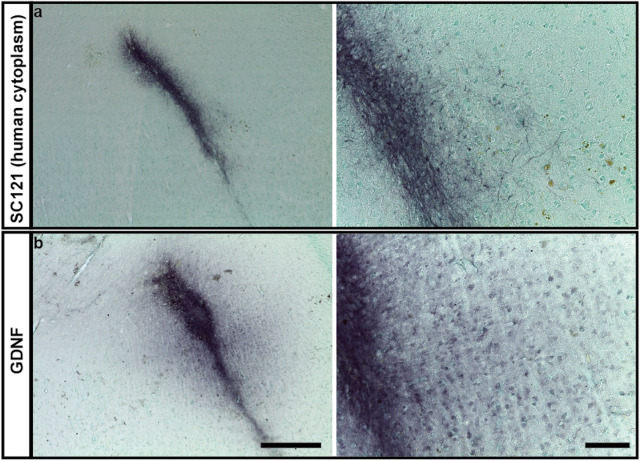 Thomsen GM, Gowing G, Latter J, et al., Delayed Disease Onset and Extended Survival in the SOD1G93A Rat Model of Amyotrophic Lateral Sclerosis after Suppression of Mutant SOD1 in the Motor Cortex. The Journal of Neuroscience 2014;34:15587-15600.